NEW-PAGE is a keyword in ABAP used for creating a new page in our reports ( lists ). 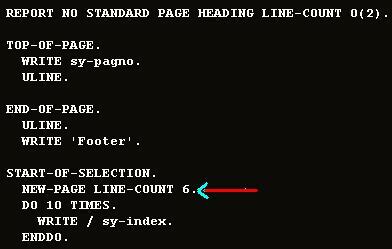 When this statement executed a page break will be triggered and output starts appearing in the new page after the header area. NO-TITLE|WITH-TITLE : Specifies weather standard title should display on the page. NO-TITLE wont display the standard title. NO-HEADING|WITH-HEADING : Specifies weather column headings should display . LINE-SIZE : How much width for each lines in the page.